For the anniversary of the jury verdict that found George Zimmerman not guilty in the shooting death of Trayvon Martin, New York's Public Theater and L.A.'s Center Theatre Group presented a program of short plays entitled Facing Our Truth. 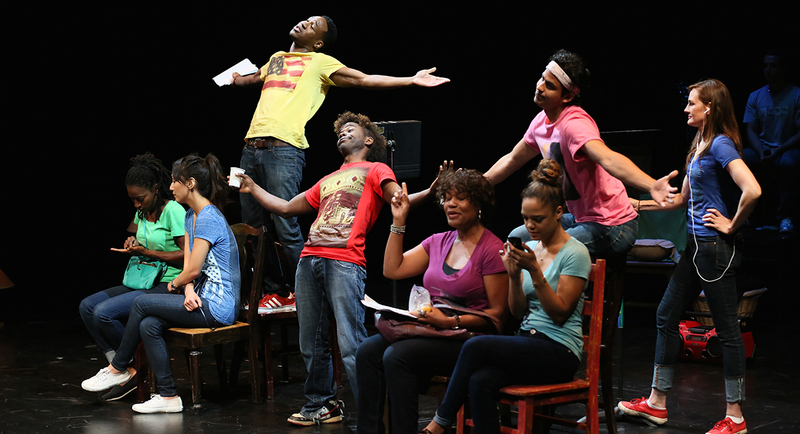 Hoping "to incite serious discussion in our collective communities around these urgent issues," New York-based New Black Fest had commissioned six playwrights to write 10-minute plays "on the topic of Trayvon Martin, race and/or privilege." Center Theatre Group held its staging at the Kirk Douglas Theatre, involving its Education Department with a Saturday, July 12 matinee for students. Some of the young audience members were brought the next day, the first anniversary of the acquittal, for a post-matinee discussion on the impact of the crime, trial, and play. The Public Theater, with separate cast, directors, and features, held its program that evening in New York. Facing Our Truth was promoted to the press as a reading, but except for one or two occasions where an actor carried a few pages which likely held last-minute rewrites, directors Shirley Jo Finney and Michael Matthews had their ten actors solidly off book. By calling it a reading, the theater activated the universal policy that protects plays-in-development from premature criticism – or praise – by theater critics applying full-production standards. While it does defang the reviewers, it may discourage attendance by some who, like a couple of longtime theatergoers, subscribers, and supporters I recently met, never attend what they assumed to be substandard fare. It is not only possible but important, however, to cover, without a thumb up or down on the merits of the scripts, an event that ended with the audience on its feet for a well-deserved ovation. The three plays in the first half were Winter Miller's Colored (pictured above), in which passengers on a New York subway are drawn into a discussion about income disparity; Dominique Morisseau's Night Vision, in which we meet a husband and wife before he slips into a sweatshirt and out for something she needs at the store; and Dressing by Mona Mansour and Tala Manassah, about a mother and son disagreeing over the messages his clothes send. After the break, it was No More Monsters Here by Marcus Gardley, a high-concept satire on racial identity; The Ballad of George Zimmerman by Dan O'Brien and composer Quetzal Flores, which incorporated transcript and testimony to look at the original confrontation, killing, and court verdict; and Some Other Kid by A. Rey Pamatmat, which imagines a teenager heading out to buy some candy and drinks for two friends he just helped get together. The hooded sweatshirt – or hoodie – that Martin wore the night he was killed had been cited by Zimmerman, the neighborhood watch coordinator for a gated community, as the reason he challenged the 17-year-old that night. For Zimmerman, that hood had removed Martin's individuality and identity as completely as if it had covered his face. It was a unifying symbol for the program of plays, as it had been for the thousands who demonstrated following the murder and verdict. Another common element in several plays was to let the audience get to know a character, with his rich individuality and identity, and then send him out to become faceless in the eyes of authorities. In staged reading fashion, Finney and Matthews brought actors to center stage while the others watched from upstage platforms of varying heights. Richard Peterson's lights and Adam Phalen's sound design helped create locations for the actors' movement. Lamps from the recent production of Kimber Lee's different words for the same thing set [REVIEWED], were recalled to add their illuminating symbolism from the sides of the stage. The excellent ensemble of veteran actors was made up of Lorenz Arnell, Demetrius Grosse, Deidre Henry, Aaron Jennings, Ameenah Kaplan, Erick Lopez, Linda Park, Deborah Puette, Tessa Thompson, and Kevin Yungman. While Henry, Park, Puette, and Thompson have all earned praise in past Theatertimes' reviews, these readings provided welcome introductions to the others among whom Grosse and Kaplan were especially impressive. Whitney Oppenheimer designed the costumes and cast member Kaplan choreographed movement and added percussion on The Ballad of George Zimmerman. Thanks to Keith Josef Adkins, director of The New Black Fest, for instigating this fine program, to The Public and CTG for endowing it with their resources, and to the onstage artists who once more proved the "reading" is the best kept secret in theater. You can hear Adkins speak discuss the project on a Soundcloud podcast.